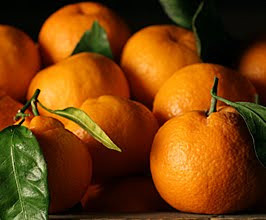 Clemetines, Satsumas, or any kind of Orange. They're at their juicy best in December. 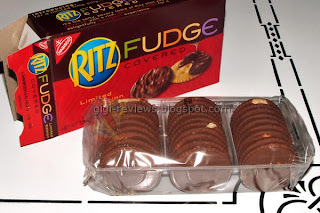 Fudge covered Ritz crackers will give you that sweet-salty crunch that we all crave. 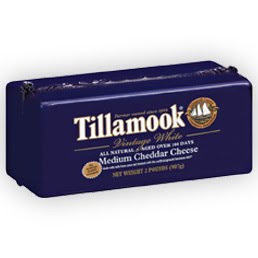 Tillamook cheese. I love the stuff. I keep a couple of babyloaves on hand to slice up for a cheese platter. I love the Vintage White Cheddar, Pepperjack and Sharp Cheddar. I just discovered these new crackers and I'm hooked. Along with the nutty pecan flavor, you get a subtle maple sweetness. Nut Crisps and Tillamook Cheddar are my new favorite lunch buddies. Here's a tiny picture of Nestle Chocolate Mint Instant Cocoa Mix. I'm not normally a fan of instant cocoa mix, but this version is rich and flavorful. With some whipped cream and marshmallows, we're talking instant party. Great ideas! There nothing worse than running to the store every time their is unexpected company! Time just keeps flying by; I afraid it will be Christmas before I know it. What yummy looking things - most of which I've never seen before. I'll keep my eyes peeled now! I like to keep a batch or two of homemade Chex Party Mix in the freezer. It thaws quickly and is always a hit! I also like to make small cheese balls, these keep in the fridge and are delicious. What a great idea. Now I want a cheeseball and chex mix right this minute! During the holidays I always keep a baked brie in brioche (from Costco) on hand. It's easy to cook and is so delicious. It's also very pretty when you slice into it. Amy, I love baked brie and I've never ever tried Costco. I've got to get some. That would be so easy and elegant too. Thanks for sharing all the good snacks and treats you've found. I can't wait to try the hot chocolate and the Ritz crackers. I also like to have jars and jars of homemade hot fudge in the refrigerator and vanilla ice cream in the freezer, along with buttermilk so we can make everyone's favorite Chocolate Sheet Cake. Chips and Salsa from Chili's are always great to have on hand too, especially if you can send a husband out to go and get some. Thanks for the fun post. I loved it. 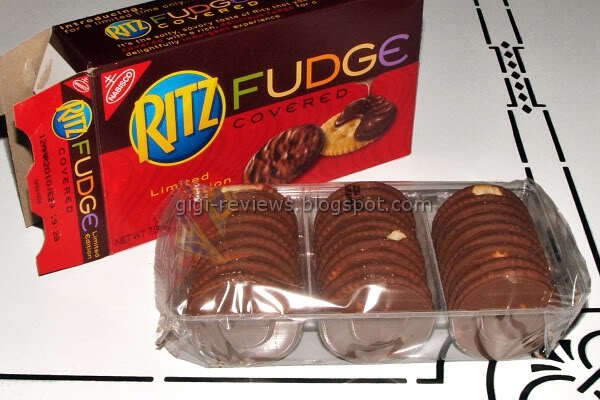 Fudge Ritz? Who Knew? I better grab some. I don't have anything on hand except for baking supplies. I always have stuff for cake or cookies, but nothing readymade. Maybe that is why no one ever stops by my house. As for your counterpart, Miss Leslie...she is "just like you". We popped in on her on a Sunday afternoon to a full spread of goodies. I just talked to Valerie this afternoon about how badly Leslie messed up her post-baby diet, and how badly she wanted another piece of that cake. Yum! I will keep watching the two of you, and maybe one day I will be worthy of houseguests. I always make sure I have fruit, booze, chocolate, and molasses on hand. I somehow always use absurd amounts of these things during the holidays. Last year I made truffles with orange zest and Grand Mariner as a last minute gift. i remember that we always stocked "guest food" in college! I haven't done that in ages, but we always seem to have plenty of food around. gotta try those ritz. wow. Oh yum! All my favorites! I see lots of people I know in your Thanksgiving pictures! Wish I could have had some of that Thanksgiving dinner! Have fun getting ready for Christmas Prudy! Les, of course I remember the song. And Texas sheet cake-we don't have any parties without it, do we? I missed it on Thanksgiving. As for homemade hot fudge, ooooh-gimme some now. That's a good idea. I don't think I could keep chips and salsa stocked, because well...I would eat them all. But I would have a nice party all by myself. Would you like to come? It's friendlier with two. And of course I remember that song, Barbie! Michal-I loved our guest food. Of course we ate most of it sans guests, but I loved it. I remember eyeball gum, small cans of Hawaiian punch and holiday oreos. I don't remember offering any of it to anyone but ourselves. But we did have a Halloween fireside, so maybe we served some of it then????? And I do remember eating a heck of a whole lot of chocolate covered peanuts, courtesy of your Little S's from the candy counter. I'm back. I saw that my adorable neighbor left you a comment above me. She's the kindest, nicest, cutest person. You would love her. Also, I had such a good time with you this whole trip. You were hilarious and made us all laugh so hard with your Michelle&Erin Stories. I think you two could write a book about them. I love that you remember the song, "You're just like me." What made it so hilarious was you breaking into song and singing and dancing to it. Only you could make a Barbie movie and song so hilarious. It was so nice of you to cook and clean up after all of us. Mary Kate and I were just discussing what a great sister you are to all of us. Thank you, Prudy. We love you. Oh I can't wait to try Fudge covered Ritz Crackers. They sound delicious. I love to have White Fudge Covered Oreos on hand, but they never last. We all love them just a little too much. Your post is making me want to whip up some holiday snacks, but I still haven't unpacked. What do do , what to do? I make chocolate covered ritz crackers. But I put a little mint extract in. I loved this post! Chocolate covered ritz sound so good. I loved hearing everyone's ideas for keeping a stocked pantry for unexpected holiday guests. The brie from Costco sounds delicious and so does Leslie's shiny bottles of homemade hotfudge and Catherine's holiday oreos. I wish I could come over and be the unexpected guest! Thanks Prudy! Catherine- I can't ever find the white chocolate covered oreos. I actually just bought the mint fudge covered oreos last Monday and was thinking of all the good times raiding your freezer for them in high school! I miss you! We need to get in contact. @Prudy-Where do you get chocolate covered ritz? I have got to try those! @Leslie-Are you going to share that homemade fudge recipe! Yum! And finally, my contribution to "must haves": Homemade chocolate chip cookie dough in the freezer. You can make it ahead of time, then whip it out and have homemade cookies in no time. And if you are like me...if the guests don't hurry and come soon, it might all be eaten up before they get there!!! Ooooops! I went and bought the brie at Costco tonight. Do you serve plain or with crackers? Rebecca-I like baked brie with crackers and some fruit-grapes or apple slices. Kim-I've seen fudge covered Ritz at Target and Albertson's. And welcome by the way. Stop by and raid my freezer anytime, baby. I found the fudge covered Ritz at Fry's (Kroger) last year after Christmas (it's not my regular store, but they were having a sale so I popped in and there they were, just waiting for me) and holy moly... soooo good. I believe they are a Christmas-time special, so stock up and maybe freeze some cause they are SO worth it!! Thanks for the reminder, I will be headed to Fry's tomorrow to get some!